You will earn 3,635 Reward Points. Earn 1 reward point for every 1 dollar spent. Temperature Priority: The C5 9 Series controller prioritizes heat generation over humidity generation assuring the cabinet holds food at the desired temperature, promoting food safety. Control: The intuitive 9 Series solid state controller provides continuous monitoring of both temperature and humidity, providing accurate control over the internal environment of the cabinet, resulting in better food quality. Actual temperature and relative humidity are measured, displayed, and controlled. Performance: Rapid heat-up and recovery times, and precise humidity control, are achieved with a digitally controlled dual-element ducted heating and humidity system. Intelligent power distribution maximizes efficiency and assures food is held at the desired temperature. Low water sensor and low temperature alarm assure cabinet is performing safely. Doors: Full Length Solid, Full Length Clear, Dutch Solid, Dutch Clear. All are lift off and fi eld reversible. Intuitive: Easy-to-use controls that anyone can understand. Humidity: Measures and displays actual cabinet relative humidity. Low-Temp Alarm: Assures cabinet is operating at desired temperature. 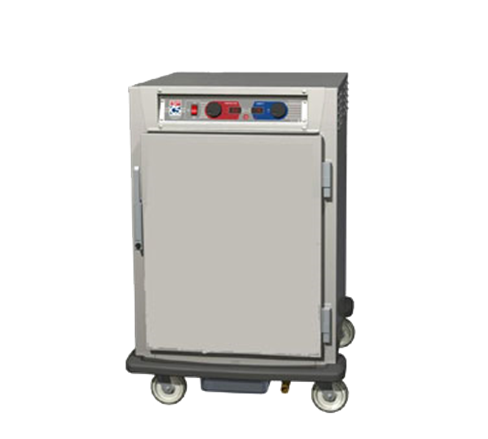 Temperature Priority: 9 Series controller generates heat before humidity for food safety. Recall & Memory: View settings at the touch of a button. Settings are saved when turned off. Low-Water Alarm: A safety feature that indicates when water is needed. Water element will not be energized when water is low. Solid doors are fully insulated, double-panel construction. Clear doors are double-pane, tempered glass. Argon filled with Low-E coating. Bumper/Drip Trough: Non-marking polymer bumper and drip trough combination. Display and Controls: Actual cabinet temperature and relative humidity display with individual control dials for each. Cabinet Material: Type 304 stainless steel; 20-gauge polished exterior; 22-gauge interior, or .063" aluminum, brushed exterior, natural interior. Humidity Generation System: Closed loop controlled 1950 Watt heating element with ducted air system, low water sensor, and 4 1/2 gallon water reservoir (filled to 1/2" from top) with drain. Heat Generation System: Thermostatically controlled closed loop feedback with 1950 Watt heating element, ball bearing blower motor, and ducted air system. Low temperature alarm enable/disable.